Horse World is a game you can play on Facebook. In this interactive game you first get to select, design, and name your very own horse. You can then train your horses for different competitions. And to get more money you can board horses. It includes both English and Western riding. Along the way you can also build up your property by building round pens, dirt tracks, and even a dressage ring for training your horses. You can also buy the barn of your choice and any horse or horses of your choice from American Saddlebreds to Quarter Horses and even donkeys. You can have multiple horses. This game is mostly free though there are things you can buy as well. I was not all to impressed with this game’s graphics, however, but they were okay compared to some games I have played. 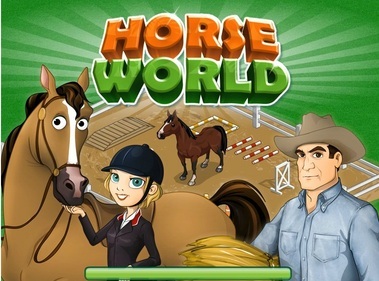 Have you played Horse World on Facebook? Share your review, tips or questions in the comments below! The game seems to be gone now. How do you start playing? It freezes and there are no directions on what to do? I think that is what everyone else is asking too..
Not aloud, then oh well, wait till you can get one, then play HorseWorld.